Four area nature centers invited acoustic ecologist Gordon Hempton to speak at a collaborative Earth Day event in April. While in town for a series of talks and walks in nature preserves and environmental centers in the Milwaukee area, WUWM's Susan Bence met up with internationally-known acoustic ecologist Gordon Hempton. Over three decades ago, a thunderstorm inspired Hempton to examine his life. “It happened in a thunderstorm and I’d been in plenty of thunderstorm before, but this one I heard different," Hempton says. "It was just a a transformative experience for me. I felt at the end of that thunderstorm that I wasn’t a listener at all, that I was going through this life and not really living it. So I dropped out of graduate school and I didn’t know who I was going to become." While working as a bike messenger in Seattle, Hempton picked up a microphone and started recording people’s stories. “I didn’t just like jump into nature. No," Hempton says. "I started in the environment around me, which was the city of Seattle and I interviewed punk rockers." He remembers two men in particular – Bones and Lenny. “They talked about their very hard lives growing up. And then we segued to how they salvaged scraps of aluminum and copper in order to buy each other Christmas gifts,” Hempton says. That’s when he realized sound recording is portraiture. “It's a picture that can’t be glimpsed and it develops in the imagination of the listener," he says. "That’s when I realized decided I didn’t want to go in the studio and create something new; I want to find these special opportunities in the real world and share them." So, where did nature come in? Hempton says during the long stretches waiting for the next freight train, he began to hear birds in the air - between the sounds of the rail. Hempton says the esoteric question came to him and stayed there - why does a singing bird sound like music? “They don’t sing for our benefit, but it’s music to our ears," Hempton says. "And the range of human hearing from 20 vibrations to seconds to 20,000 per second. We aren’t equally perceptive to sounds across that range from low to high frequency. But there’s a very distinct bandwidth from 2.5 kilohertz to 5 kilohertz which matches the resonant frequencies where we have the super sensitive hearing." Hempton insists that sense links us to our ancestors. “That is the bandwidth that held the most critical information for their survival. To be able to hear faints sounds in order to better survive. So the big question is what is the human ear tuned for,” Hempton says. “And there’s a good reason our ancestors had to hear birdsong in order to survive," he says. "They were nomadic hunters and gatherers. They needed to find places of prosperity and birdsong is the number one indicator of habitats prosperous to humans. If the birds are singing there is food, water, a favorable enough growing season to raise the young from the nest." Hempton says the lessons of birdsong set the course of his life’s work. He set out to record pure – free of noise pollution - sounds. Hempton discovered he had to travel further and further away from home to find it. Hempton has taken his sound equipment to spots across the globe – where natural sound is not yet swallowed up by human-made stuff. Hempton and crew on Zabalo River, Ecaudor. Hempton still has a long list of places he hasn’t been – where he wants to capture raw natural sound - and places to which he hopes to return. Places like, Zabalo, Ecuador, where the Cofan people live. “They are the most phenomenal listeners. I had my guide Philip say, can you hear that. I strained, and I didn’t. He asked again, I answered, no. He could hear monkeys from 20 miles away,” Hempton says. Hempton says both the quiet areas and its people’s way of life is under siege. “They are a very self sufficient tribe but they do need money to fight legal battles to defend their land," he says. "Because illegal poaching and mining threaten their self-sufficient existence." He hopes to help harvest its sounds. ”Because they are one of the world’s last great quiet areas, I believe they can harvest the sounds and sell them to commercial industries for movies and everything," Hempton says. "I believe there is an excellent opportunity to develop a very eco-friendly economy with these quiet areas that need to be saved." Hempton faces a few challenges himself – one central to his craft. “I’m right now in the middle of my second bout of hearing loss in my left year. So this my first spring in two years that I’ve been able to hear the birdsong. So I’m really thankful for that,” Hempton says. Hempton dismisses the inconvenience, he’s too busy talking up the plight of the Cofan people, fighting noise pollution in principal, and protecting a spot very close to his backyard – Olympic National Park, which he hopes to have designated as a no flight zone. “There is not one place on planet earth off limits to noise pollution," he says. "I used to think it would take more than a generation or two before natural quiet would become extinct. I’m 61; I hope to live a long life, but it could very well become extinct within my lifetime." Hempton’s been waging his Olympic Park crusade since 2005. He hopes to see legislation pass by 2016 – the year the National Park Service celebrates its centennial. “What is the importance of natural quiet in our lives? It’s the perfect antidote to toxic noise. We really need to know when we’ve had enough, there is a quiet place to go to. It’s important for people to know it exists,” Hempton says. 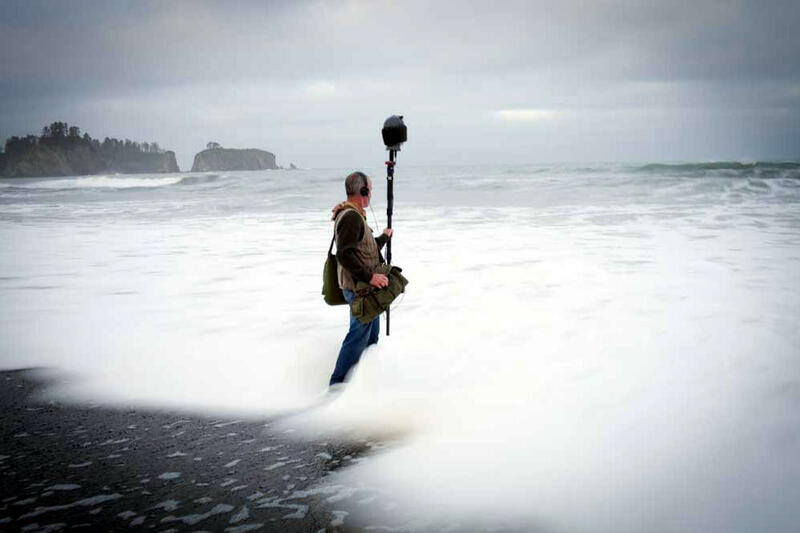 Gordon Hempton is known as the Sound Tracker; and is founder of Quiet Planet in Washington State. Acoustic ecologist Gordon Hempton has traveled the globe and made it his mission to preserve the remaining quiet places. Tuesday evening he’ll share his experiences at the Mequon Nature Preserve.